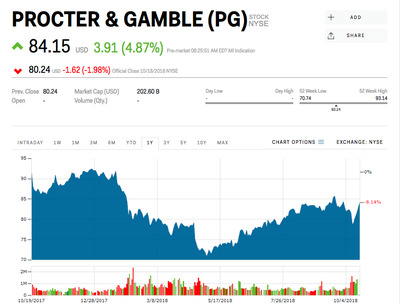 Procter & Gamble beat on both the top and bottom lines. The consumer-products giants reaffirmed its fiscal-year 2019 forecast. Shares gained about 5% ahead of Friday’s opening bell. Watch Procter & Gamble trade in real time here. Procter & Gamble shares surged ahead of Friday’s opening bell after the company delivered strong first-quarter results and reaffirmed its forecast for fiscal-year 2019. The consumer-products giant posted core earnings-per-share of $US1.12, outpacing the $US1.08 that analysts surveyed by Bloomberg were expecting. Net revenue came in at $US16.7 billion – in-line with a year ago – but that was good enough to top the $US16.46 billion that analysts were hoping for. Organic sales jumped 4%, led by a 7% gain in its beauty segment. The company said sales took a 3% hit due to the stronger US dollar. P&G reaffirmed its forecast for organic sales growth of between 2% and 3% for fiscal 2019, and said it still expects core earnings-per-share growth of 3% to 8% versus its fiscal 2018 core EPS of $US4.22.